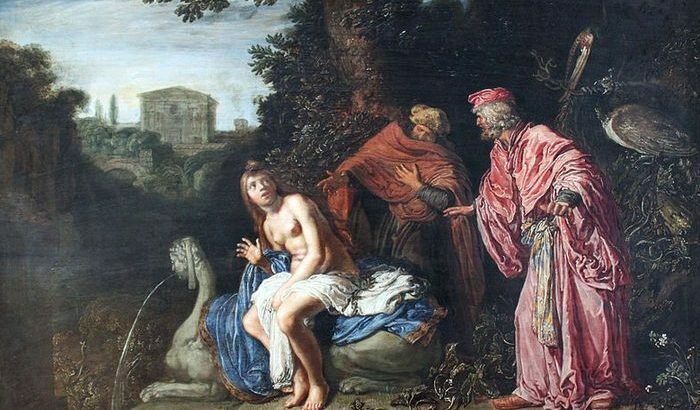 There dwelt a man in Babylon, called Joakim: and he took a wife, whose name was Susanna, the daughter of Chelcias, a very fair woman, and one that feared the Lord. Her parents also were righteous, and taught their daughter according to the law of Moses. Now Joakim was a great rich man, and had a fair garden joining unto his house: and to him resorted the Jews; because he was more honorable than all others. The same year were appointed two of the ancients of the people to be judges, such as the Lord spake of, that wickedness came from Babylon from ancient judges, who seemed to govern the people. These kept much at Joakim’s house: and all that had any suits in law came unto them. Now when the people departed away at noon, Susanna went into her husband’s garden to walk. And the two elders saw her going in every day, and walking; so that their lust was inflamed toward her. And they perverted their own mind, and turned away their eyes, that they might nof look unto heaven, nor remember just judgments. And albeit they both were wounded with her love, yet durst not one shew another his grief. For they were ashamed to declare their lust, that they desired to have to do with her. Yet they watched diligently from day to day to see her. And the one said to the other:—“Let us now go home: for it is dinner time.” So when they were gone out, they parted the one from the other, and turning back again they came to the same place; and after that they had asked one another the cause, they acknowledged their lust: then appointed they a time both together, when they might find her alone. And it fell out, as they watched a fit time, she went in as before with two maids only, and she was desirous to wash herself in the garden: for it was hot. And there was nobody there save the two elders, that had hid themselves, and watched her. Then she said to her maids: ‘‘Bring me oil and washing balls, and shut the garden doors, that I may wash me.” And they did as she bade them, and shut the garden doors, and went out themselves at privy doors to fetch the things that she had commanded them: but they saw not the elders, because they were hid. Now when the maids were gone forth, the two elders rose up, and ran unto her, saying:—“Behold, the garden doors are shut, that no man can see us, and we are in love with thee; therefore consent unto us, and lie with us. If thou wilt not, we will bear witness against thee, that a young man was with thee: and therefore thou didst send away thy maids from thee.” Then Susanna sighed, and said:—“I am straitened on every side for if I do this thing, it is death unto me and if I do it not, I cannot escape your hands. It is better for me to fall into your hands, and not do it, than to sin in the sight of the Lord.” With that Susanna cried with a loud voice: and the two elders cried out against her. Then ran the one, and opened the garden door. So when the servants of the house heard the cry in the garden they rushed in at a privy door, to see what was done unto her. But when the elders had declared their matter, the servants were greatly ashamed: for there was never such a report made of Susanna. And it came to pass the next day, when the people were assembled to her husband Joakim, the two elders came also full of mischievous imagination against Susanna to put her to death: and said before the people, “Send for Susanna, the daughter of Chelcias, Joakim’s wife.” And so they sent. So she came with her father and mother, her children, and all her kindred. Now Susanna was a very delicate woman, and beauteous to behold. And these wicked men commanded to uncover her face (for she was covered) that they might be filled with her beauty. Therefore her friends and all that saw her wept. Then the two elders stood up in the midst of the people, and laid their hands upon her head. And she weeping looked up toward heaven: for her heart trusted in the Lord. Whole story can be read on link The History of Susanna. General The History of Susanna. permalink.